Malankara World’s objective is to provide spiritual manna to the Malankara Syriac Orthodox Christian Church faithful scattered all over the world. Our special emphasis is on helping our families. Families are the microcosm of the church. So, in addition to spiritual material you will find resources to help families overcome day to day issues. A custom made chandelier with pictures of early church fathers and saints looking down on the congregation simulating the tower of saints in the Eastern Orthodox Churches. 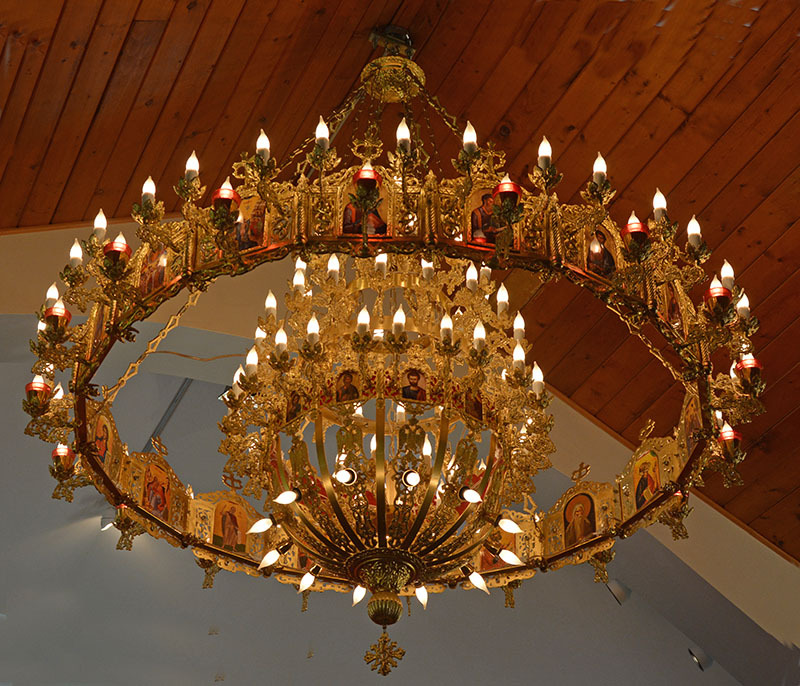 This chandelier was custom designed and built for our "Aramana Cathedral" - Malankara Archdiocese of the Syriac Orthodox Church in North America Head Quarters in Whippany, New Jersey, USA. Photo by Dr. Jacob Mathew, Malankara World. 31 Chapters, Over 250 articles WOW!! Malankara World Journal is our weekly journal. It is rich with relevant information for Christian Living. Read the Previous Newsletters at Malankara World Journal Archives. Get your own copy of the journal, as soon as published, by subscribing to the journal. It is free of cost and free of spam. You can cancel the subscription any time if you wish. Click here to register your name with Malankara World. Malankara World will be the first place to seek information related to spiritual and family support topics. No need to search all over the web. Information will be presented in an easy to use format. It is written for laymen. At Malankara World, you can learn, understand and participate in spiritual ministries. Myriads of resources for meditation such as devotionals are provided, with weekly bible reading and updated sermons of the week. Before going to the church on Sunday, you will know what the lectionary readings from Bible are offered that day. Unlike traditional churches, our chapel is always open. The primary mission of any spiritual organization is to teach you. Malankara World will provide you with ample resources to learn. World renowned experts who are behind Malankara World will answer all your questions. Continual growth through learning is a key aspect of Malankara World. Malankara World strives to create a community of believers. The issues are discussed weekly in Malankara World Journal. 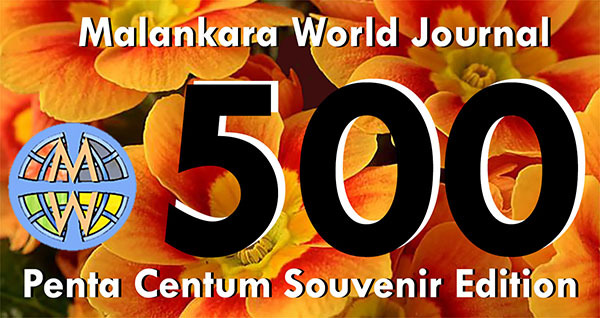 Critically acclaimed, rich in information, Malankara World Journal is a weekly journal of the Malankara World. Strict editorial guidelines ensures that the journal carries only quality articles commensurate with the beliefs of the church as well as articles useful for the families. No politics, fights etc. are permitted. Read the current edition here. Read the archives here. Jesus spent much time in prayer. On at least one occasion, He 'continued all night in prayer to God' (Luke 6:12). Addresses issues that are of interest to family. Come and prepare some mouth watering snacks and food items with the recipes given. You can also make some exotic drinks!! An epic poem by the 17th-century English poet John Milton. All 10 books are included. We cover living and departed saints and doctors of the church. Considered by many to be the greatest poet and theologian of the Syriac Orthodox Church, St. Ephrem or Aprem holds a special place in the traditions of both Oriental and Eastern Orthodox Churches. eBooks Full Books for you to enjoy! Latest Edition of Malankara World Journal is available here. If you want Malankara World Journal emailed to you as soon as it is released, please register here. Is infant baptism in accordance with the will of God? What is the uniqueness of the Orthodox Churches? Did Jesus Have any 'Brothers'? See more similar articles in How is Orthodoxy Different? General - Sermons, Essays etc. It was small enough to overlook. Only two words. I know I'd read that passage a hundred times. But I'd never seen it. But I won't miss it again. It's highlighted in yellow and underlined in red. From Jesus' birth and youth, the cross cast its shadow ahead of Him. The cross is inextricably tied to the Person and the work of the Lord Jesus Christ. Christ offers forgiveness full and free from both our self-righteous goodness and our unrighteous badness. This is the hardest thing for us to believe as Christians. We think it's a mark of spiritual maturity to hang onto our guilt and shame. On New Year's Eve we feel the mystery of time more powerfully than at any other time. We feel, in other words, that its flow " in which we live and in which everything constantly vanishes as the 'past' and constantly places us face to face with the unknown future " essentially contains within itself the main question that everyone is called to answer with their lives. Christianity is not a quick fix; it's a gradual step-by-step growth. This is hard for many to accept, including myself. We fall into the trap of those who claim otherwise. Everyone faces suffering at different points in their life. The more important question is how we will react to our sufferings. The prayers of the Orthodox Church offer answers to this question. Temporary Protected Status for Syrians in the U.S.
Aromatic Oil has been observed pouring out from the Stone Cross of Manarcad Marthamariam Cathedral (St. Mary's Cathedral), Kottayam, Kerala, India. Faithful are pouring to the Church. Holy Oil Flowing from St Mary's Photo..... It started at 6:00 PM local time on Jan 21, 2012. Patriarch H.H Moran Mor Ignatious Zakka I Iwas has issued Apostolic Bull in this regard considering the suggestions from Holy Synod in India. This change will be for next 3 years effective August 15, 2011. A man with a paralyzed left leg has completed a 1,000-mile hike to Santiago de Compostela after being cured at Lourdes, it has been reported.